If you were thinking about installing the DirecTV Now app on your phone and subscribing to the service, this might be a propitious moment. 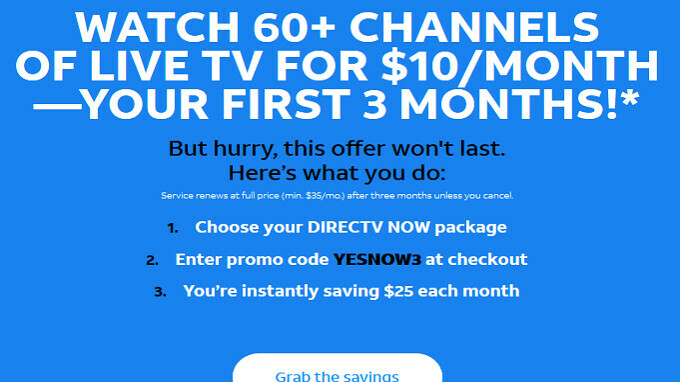 For a limited time only, you can stream over 60 channels paying only $10/month for three months. Better make a note in your calendar app when the three months expires, because after that period of time your subscription renews automatically at $35/month. To take advantage of this pricing, you have to be a first time subscriber and must use the discount code YESNOW3 when checking out. This way, you'll be saving $75 over the three month promo period. There are other promotions being offered as well. Prepay one month of service (at $35/month) to receive a free Amazon Fire TV 4K. Prepay three months of service at the regular price and you'll receive a free Apple TV 4K. No, you don't have to get your wireless service from AT&T to qualify for the discount or any of the promotions. Simply head to the Apple App Store or Google Play Store to install the app and sign up. To make it easy for you, we've included the appropriate links right here. (iOS|Android). I wouldnt bother with TV even if it was free. I spend all my time on the internet. Considering the fact that there's a ton of ads during and between shows, why pay? Will this work outside the US? We get it free with the unlimited plan we switched to a few months a go. Better route is to get the free Apple 4K TV if you are a new sub and pay the first 3 months. That's $105 for an Apple 4K TV that's worth $179. Use a cashback site and get up to another $22 off (potential $83) for an Apple 4K TV and 3 months of DTVNow.